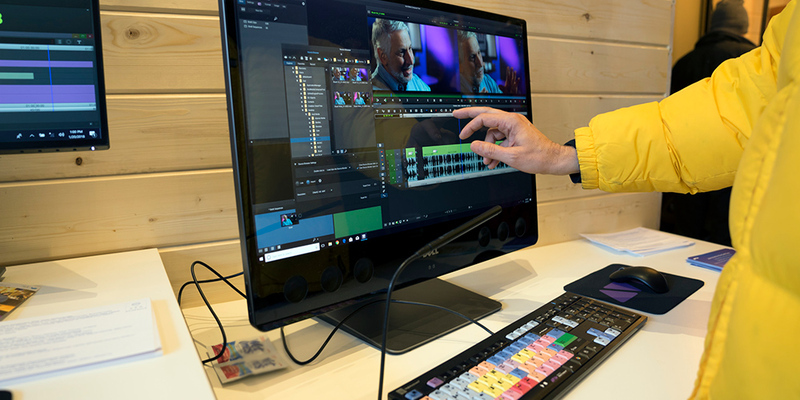 Thousands of global media and entertainment organizations, including content creators, television broadcasters, and content delivery providers rely on solutions from Dell Technologies. We are thrilled to be able to showcase our end-to-end infrastructure and technology solutions at the 2018 NAB Show in Las Vegas, spanning Dell EMC storage, servers and networking, VMware virtualization solutions, and high-performance Dell Precision workstations and displays. At the 2018 NAB Show, Dell EMC and our established partner ecosystem will demonstrate the latest solutions that help media professionals keep pace with increasing demands for content creation, playout across multiple platforms, and active archives for content monetization in Dell EMC’s booth #SL9111 in the Las Vegas Convention Center. For broadcasters, we will be showing the latest generation of our Isilon scale-out NAS storage solution. This range of file storage products sets the benchmark for high-performance and high-efficiency storage for content production, management and delivery. With a proven ability to deliver consistent high-concurrency, Isilon is designed to provide a low total cost of ownership (TCO). We will also showcase the Dell EMC Elastic Cloud Storage (ECS) object storage platform that offers media and entertainment organizations a true active archive that can be more cost-effective and more dynamic than public cloud or tape-based alternatives. Speaking of ECS, Dell EMC is collaborating with leading media asset management (MAM) solution providers Dalet and Vizrt for in-booth demonstrations on ECS. Dalet has certified the ECS object storage platform for interoperability with Dalet Galaxy, a leading MAM and orchestration platform. The combination of Dalet Galaxy and ECS enables broadcasters to simplify data management, lower the total cost of ownership for infrastructure, and enable new types of operations. Vizrt will demonstrate integration of its MAM solution with ECS, moving files seamlessly to object storage and highlighting features such as partial restore. Dell EMC has also integrated our ECS object storage platform with Oracle’s DIVA content storage management solution. In today’s evolving media landscape, a wide variety of new delivery mediums are providing broadcasters an unprecedented opportunity to monetize their content. The combination of Oracle Front Porch Digital, Isilon and ECS enables media organizations to unify their media assets in a centralized, immediately accessible archive, providing the foundation for a cost-effective, multi-format distribution model. For content creators, Dell EMC will be showing the Isilon F800 All-Flash scale-out NAS supporting industry-leading creative applications. The Isilon All-Flash array gives visual effects (VFX) artists and editors the power to work with multiple streams of uncompressed, full-aperture 4K material, enabling collaborative, global post- and VFX pipelines for episodic and feature projects. For the first time, content creators can get a true scale-out architecture with high concurrency and super-fast All-Flash network-attached storage with consistently low latency to turbo-charge both high-throughput and random access workloads. In our booth at NAB, we will be demonstrating how easy it is for users of Adobe Premier to perform 4K editing of uncompressed DPX files on a shared Isilon F800 All-Flash array. Similarly, we will show how Isilon F800 has the All-Flash horsepower to support demanding uncompressed 4K and UHD workflows for users of Blackmagic Design’s DaVinci Resolve. Many of our leading animation and VFX customers have already adopted the Isilon F800, eliminating the requirement for “performance silos” in customer environments to help them accelerate their projects and dramatically reduce render wall-clock times. For pay-TV, telco, and over-the-top (OTT) operators, Isilon provides a choice in how organizations scale. Isilon F800 All-Flash performance storage nodes accelerate live and catchup workflows, together with high capacity H500 storage nodes for video on demand (VOD) or cloud digital video recording (CDVR) Origin storage. Dell EMC continues to simplify the way that content providers create and manage high definition (HD), ultra-high definition (UHD) and high dynamic range (HDR) programming while enabling content delivery to any device, anywhere, at any time. For system administrators, Isilon brings the inherent simplicity of network-attached storage, enhanced by the simple to use management tools of the OneFS operating system, and powerful monitoring utility of SyncIQ – freeing valuable system administrator time and resources. We take great pride in our work with customers and partners from all corners of the media and entertainment industry – including organizations in post-production, animation, visual effects, broadcast, pay TV and subscription video on demand – who rely on Dell Technologies’ comprehensive technology portfolio to assist with content creation, management and delivery. We’re looking forward to connecting at the 2018 NAB Show – let’s discuss how Dell Technologies can help your organization enable next-gen media workflows with high-performance solutions ranging from storage, networking switches, servers, workstations and displays.